We had a week of beautiful warm weather last week. We were really surprised that the temps got up to 93 here on Wednesday and the pressure system that night broke with a huge thunderstorm that rolled onto the farm off Flathead lake. The wind mostly came from the south but there were gusts from the west as well. Wind changing directions is usually a one-way ticket to row cover blowing off our crops. We did have some pieces come off and damage a few of the delicately stemmed early planted broccoli. Luckily it was a short storm and there was minimal damage. Our crew all handled the heat like champs last week. While upper 80s and low 90s isn’t super hot, we have been working outside in about 50 degree weather for the last three months and that kind of a jump can take a big toll on your body when you work outside. This year we are so fortunate to have a full time three-member crew of Mandy, Jay, and our new full time employee Kari Hammer. I could go on, for days, about how wonderful Kari is! She is a quick learner, hard worker, great communicator, and generally just awesome to be around. We are so thankful to have her! 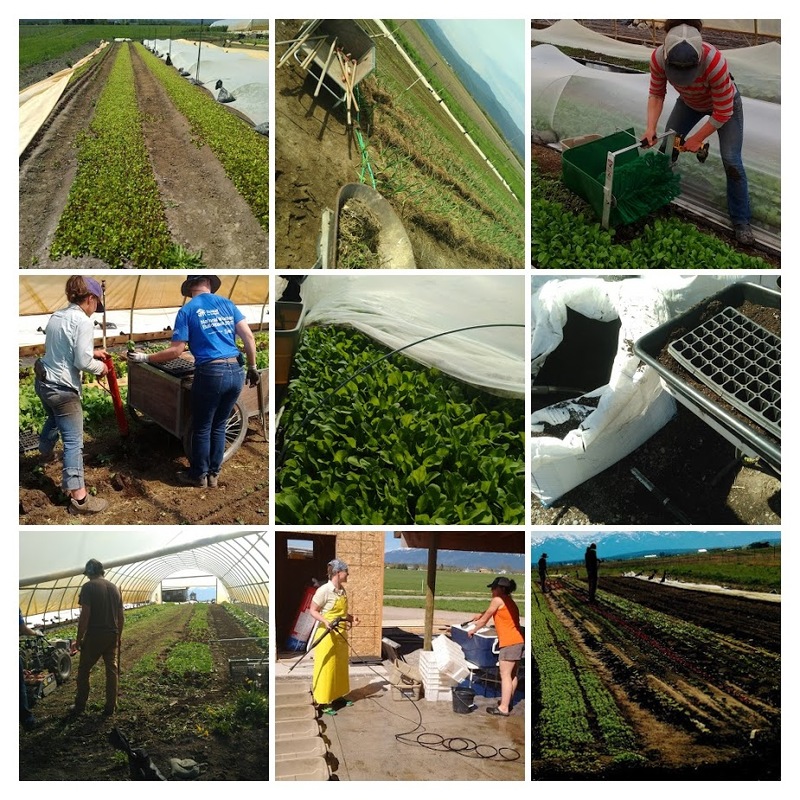 We have been able to invest this year not only in the equipment necessary to make the workload on the farm more sustainable, but also invest in having more labor on the farm; we know many farms come and go and we are deeply committed to this work. We are able to make these investments in tools and a labor force because of our dedicated customer base and we are so thankful for all of you. Bringing a sustainable workload to an organic farm is a huge piece of longevity in sustainable agriculture. It is so easy to ‘work yourself to death’ and get burnt out before the farm gets the momentum necessary to really be ‘on it’s feet’. We are so blessed to be doing this work in community with our customers and our CSA is the heart of the customer base of our farm. 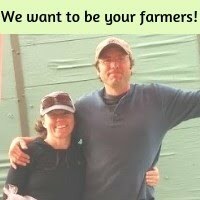 We want to mention a bit about the packaging and quantity of the veggies in your weekly box. We really like that we can use more minimal amounts of plastic in the boxes than we use at market. We use a thin small ‘produce bag’ rather than the gusseted plastic bags we use for market. We also don’t use a twisty-tie on the greens, saving a little bit of something adds up when it’s 100 members for 21 weeks! Also, someone last week asked if we always include all the items in the partial shares. We do. And sometimes, so that we don’t go over the value of the share more than 15-20% over the course of the season, one or two of the partial share items will be small. The Partial shares are a value of roughly $18/week, and to include all the items in the box their often there will be a bundle or bag that, to me, looks really really small. But we have decided, for now, we would rather include all the items even if some of them are in very small amounts, rather than not have some of the items included in the partial shares. Please let us know if you have any questions about the size or quantity or amount of produce you are getting in your box. We love the direct relationship we have with our customers because we get such valuable feedback from you about the veggies, how you are using them, which things there are too much of and which things there are ‘not enough’. 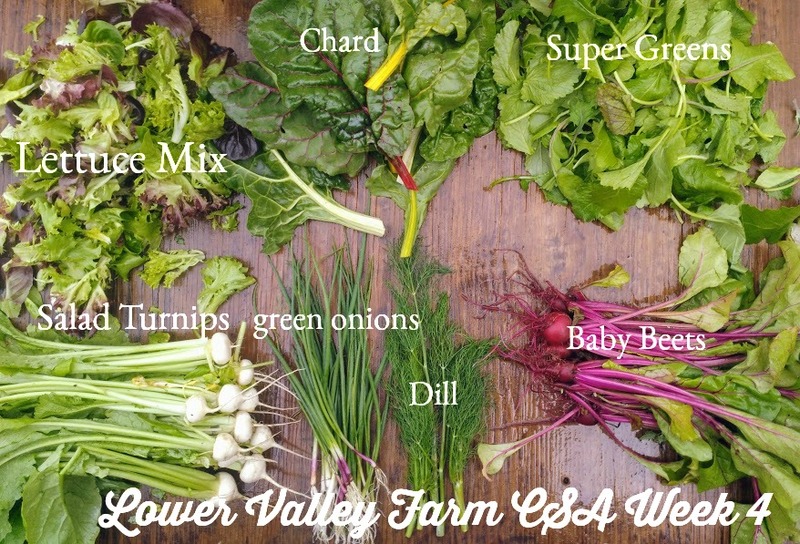 That said, we know May and June are heavy on the salad and braising greens AND the summer veggies will be here in the months to come! Chard can be used interchangeably for cooked spinach in ANY recipe. We love it for frittata, quiche, an addition to soup or stir fry, or just a quick sauteed side dish. 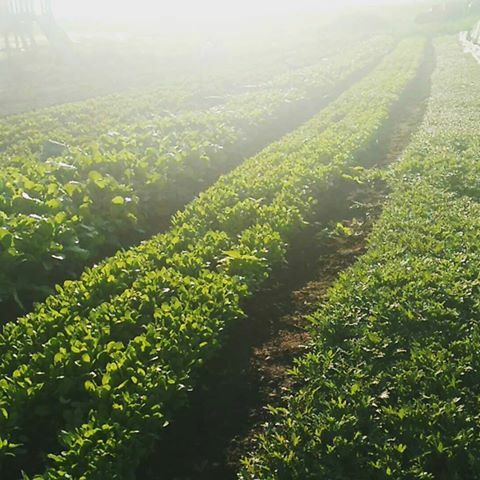 Super Greens are a mix of mustards, Asian greens, collards, and kale harvested at baby leaf. They are great for a raw salad. We especially like these as salad greens with a creamy dressing like ranch or Cesaer. If they are too bitter for you in a salad, you can lightly saute them. Baby Beets- We like baby beets with the tops removed, cut in half, and boiled until tender. Wonderful topped with dill. The generous amount of beet greens can be sauteed or boiled. When I have a lot of them I will often get a big pan of water boiling, boil the greens, run them under cold water, squeeze the water out so they are in a kind of ‘green ball’ and finely chop them after boiled. Love! Beet! Greens!